Plants for Baskets and Containers that can really take the Heat! You bought a beautiful hanging basket in early March however by the end of April it grew so large that you couldn't keep it watered. Or you planted your own basket with a plant you "know" can take the heat but then you almost have to stand by it with the water hose when hot weather comes. Sound familiar? Everyone knows that Lantana and Verbena can take the heat but unfortunately both are somewhat hard to grow in containers during the summer months. Not because they won't grow well, but because when they fill the containers with roots - and they do it quickly - they are difficult to keep watered; especially in a smaller container in the full sun. Now if you have massive planter container probably none of this would matter because your plants would have plenty of room to grow and make new roots but if you have a smaller container such as a 8 inch to 12 inch hanging basket or a pot smaller than 16 inches then you are likely to have watering problems when the plants in them reach maturity and fill the pot with roots. Unfortunately there are few plants that have the ability to grow in containers this small in the full sun, continue to look good all summer long and enable you to get by with on once-a-day watering regimen. Your plants choices for for these conditions are severely limited. Now everyone also knows Bougainvillea can take the heat, even in a 10 inch hanging basket; and you really shouldn't need to water it more than once a day. But for some reason you just want something different. Enter Purslane. 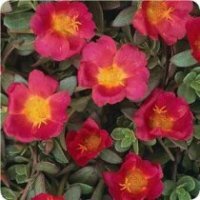 It's a close relation to Portulaca, commonly called Moss Rose. But Purslane has a lower growing, more trailing habit than common Portulaca. Plus it can take the heat like a desert trooper. Purslane comes in Red, Yellow, Pink, single bloom (This is the Rio series) and also a double yellow and red flowering form (This is the Fairy Tales series). Purslane is easy to grow and doesn't require you to station yourself next to the basket or the pot with a hose or a watering can. Once-a-day watering is all it needs, even in the hottest weather. Sometimes every other day! It's not necessary (and it's probably counter-productive) to fertilize Purslane every time you water it. Just give it enough fertilizer to grow well - once a week with a good 20-10-20 soluable liquid or Miracle Gro will do - and it will reward you with tons of blooms all summer long. The blooms do tend to close at night so this is not a good one for viewing at night. But you will have plenty of open flowers the next morning. If your Purslane is growing in a peat based soil mix allow the soil to become somewhat dry then water well until the water comes out of the bottom of the basket. In other words; soak it well. This should hold the plant until the following day, no matter how hot it gets or how big the plant gets. Most purslane is not available from seed and must be grown from cuttings so that all of the clones will exhibit the same characteristics of heat tolerance and vigor and especially flower size. These plants will set seed and the seeds will sprout but very few grow true to form of the original plants. So if you want the true original varieties you will need to keep your plant from freezing in the winter or else purchase new ones each spring. Portulaca doesn't turn you on? Then try Trailing Vinca. Trailing Vinca is a relatively new plant introduction. (Just in the last five years or so.) It comes in Red, White, Pink, Purple, and bi-colors, all blooms are single. It is a spreading and cascading form of the common Vinca that you have always grown in flower beds in hot and sunny areas, especially in areas where you couldn't quite get the hose to without some trouble. Forget to water your Vinca and it's wilting? No problem, just streach your hoss to its limit and soak the bed and the wilted plants revive and look just as good as they did before. Trailing Vinca is just as tough in pots and baskets as common upright Vinca or Periwinkle is in the ground. When the daytime temperatures stay over eighty degrees and the nightime temperatures stay over sixty degrees Trailing Vinca grows very well. 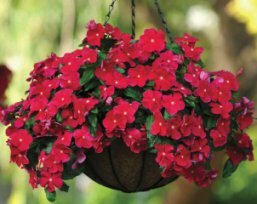 One plant will fill a standard ten inch hanging basket and two or three plants will fill it faster. The hotter it gets the faster it will grow! When the plants starts to bloom it doesn't quit. The flowers keep coming all summer long and at times can completely cover the leaves. How's that for flower power? Water and care for your Trailing Vinca in about the same manner as described above for Purslane. When the plant is dry soak it well and then let it dry out. A bit of wilting won't hurt it a bit and a good watering will bring it back quickly. For best flower production don't let the plant dry out too much but on the other hand don't keep it soggy. Give it water when it's thirsty (when the plant is wilting slightly or when the pot is light if grown in peat based soil mix.) and it will reward you with tons of flowers.